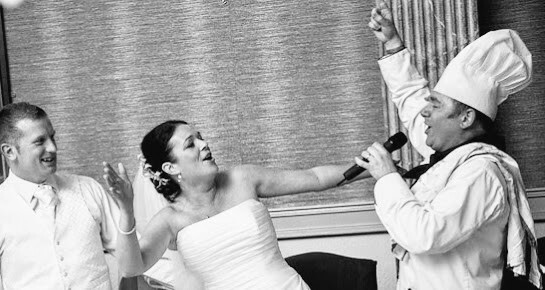 Have you ever had the huge pleasure of experiencing a singing waiters wedding entertainment? They are a most unusual wedding act and wedding guests just fall in love with them! Well here are 8 reasons why singing waiters wedding entertainment will be a winner for your wedding day! There’s nothing worse than a super quiet wedding. One with a lacklustre background CD, where the only sound is of guests clinking their flatware. Cringe! If you hire singing waiters wedding entertainment for your reception, they will set the party atmosphere for the night and get your guests excited for what will be a brilliant wedding celebration! A wedding is the perfect place to mingle and meet new people, and perhaps for your Bridesmaids (or Groomsmen), to find the love of their lives. Having a unique wedding entertainment like the singing waiters will encourage your guests to start a conversation about how fantastic the night is. Naturally, your guests will swap photos with each other, selfies are such an ice-breaker! 3. You don’t have to be a diva, but you will join in! Don’t panic you don’t have to sing a solo. Seriously, you really don’t have to be a singer to join in with these performers, but because everyone is familiar with the songs they sing and better yet, they can sing many popular songs you might request – we can guarantee everyone will be singing and even dancing along by the end of the show. 4. No Song is off limits with the Singing Waiters Wedding Entertainment Show. These waiters can sing it all. So this means you can easily request your favourite wedding party song. whether it is Minnie the Moocher, Sweet Caroline, Nessun Dorma or New York, New York, nothing is off limits. 5. They are more than “just” entertaining – They are a production. From your first enquiry with Singers for Hire Singing Waiters Wedding Entertainment, you will know you are dealing with professionals. Marco and our team will discuss YOUR vision and what it is that you want for your wedding day, allowing you to improvise with creativity. If you want an opera/disco mashup that leads into modern pop music, it can be done as the sky is the limit! On the big day, the singing waiters will arrive at your wedding venue 2 hours before your dinner bell to prepare and setup the professional sound equipment. With a combination of live music, top-notch sound equipment and great humour you will quickly have yourself a wedding celebration to remember! 6. Be That Unique Wedding! Don’t fall in to the snare of following every boring wedding tradition known. Make your unique mark on the special day with something exclusive like Singing Waiters Wedding Entertainment, maybe even throw in some ballroom dancers to improve the performance! 7. Make yours ‘The Wedding of the Year’! Become “THE” couple who have the BEST wedding with so many talking points you’ll be remembered for years to come. It’s those small & unique extras that can really impress your family and friends, no matter what age! Their singing waiter Marco is an absolute entertainment legend who can seriously rock a room.